The Student Handbook is an important part of our curriculum and your journey at the Academy. 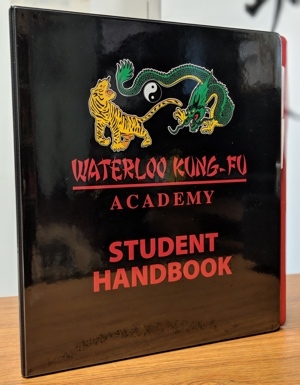 Each student in the Youth/Junior/Adult program requires a handbook; you may purchase a handbook in the WKFA office. Custom-made in Ontario, the handbook features dividers and an inside pocket to hold your Student ID Card. Bring your Student Handbook to class with you and use it to store your handouts and Training Log & Journal.